At our April meeting we tried our hand at making boxes, using old Christmas cards etc. Our efforts produced several creditable final results and Eileen later decided to go into “mass production” making over 60 to be used at St George’s Church Fete. 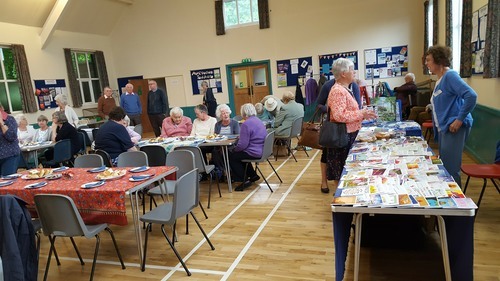 The Waterlooville Baptist Church Women’s Fellowship held their Anniversary Service on Tuesday 1st May to which St George’s MU branch were invited. There were hymns, prayers, a beautiful solo: “Count Your Blessings” sung by Flo Burnish and a most inspiring talk given by Rev Sandra Platford, minister at Aldershot Baptist Church on the afternoon’s theme of “Thanksgiving”. Afterwards we all adjourned to the church hall for sandwiches, cakes and tea. On Saturday 12th May we went to Christchurch Portsdown Branch’s Cream Tea. There were several stalls with plants, cakes, bric-a-brac, toiletries, MU Merchandise and raffle. 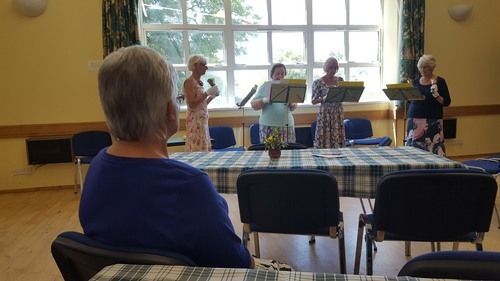 Whilst we were there we were invited by the Baptist Fellowship ladies to their Songs of Praise and Cream tea a week and a bit later. Very kindly we were invited to the hall at the Baptist Church for a Songs of Praise and Cream Tea. We sang about a dozen hymns, some very short and some I hadn’t heard of before - all chosen by their members from the 1100 Hymns Book. There were readings between each hymn, and we finished with a most beautiful setting of the 23rd Psalm. Our speaker at our May meeting was Sonja Barrand talking about The Roberts Centre. The Roberts Centre covers Portsmouth, Havant and Gosport. It began small - with a drop-in centre, but its badly needed services supporting vulnerable adults, families in crisis and children necessitated its expansion into the much larger organisation it is today. With more people becoming homeless, and many families needed their assistance, The Roberts Centre now provides many areas of help. There are courses to help with budgeting household expenditure, and parenting skills, and recipe sheets containing details for inexpensive but nutritious meals. A Family Contact Centre provides a neutral location for separated parents to see their children, with a nursery on site. Help is given for families to move out of unsuitable B&B’s and rooms into permanent homes. Emergency accommodation, a free nursery and play scheme for older children (which catered for 146 children in the past year), plus in the holidays outing to cinemas, bowling etc. 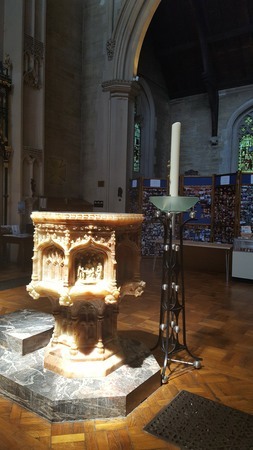 Their work is as much needed today as when Mr E C Roberts made a bequest in memory of his mother for money to be used to care for the poor and vulnerable children of Portsmouth. It is so often children who suffer most when domestic violence, drugs and poverty wreck lives and destroy families. The Roberts Centre works tirelessly to alleviate and improve the conditions for people in our local area. Much more information is available on their website. Fiona and I, plus the Branch Banner went to St Mary’s Church, Fratton, for the Portsmouth Mothers’ Union Annual Festival Service. 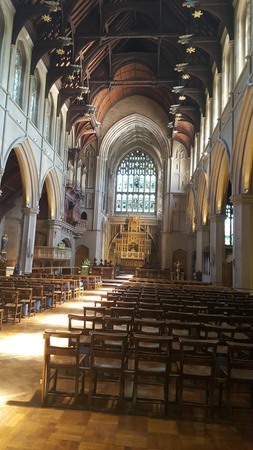 There was time to look around this beautiful church with its vaulted wooden ceiling and lovely stained glass windows, and admire the unusual font before the service began. I was to carry our Branch Banner and Fiona was given the job of handing out the service sheets. Without the usual “talk-through” beforehand we processed our Banners which were taken from us by Canon Bob White and the Venerable Dr Trevor Reader, the Portsmouth Diocese Mothers’ Union Chaplain. After the Eucharist, taken from a Kenyan Liturgy, they decided we had better retrieve our own banners to ensure we took the right one home! There were cards and MU merchandise on sale and a most welcome mug of tea (we both had a refill!) while some people had brought a packed lunch. Our branch outing this year took us firstly to Buriton for lunch at The Five Bells Inn - a lovely village pub, then some of us spent a little time in the Parish Church before we went on to Petersfield to St Peter’s Church for Compline. There was just time on the way back to the car park for some “Retail Therapy” before we came home. Five of us were able to go to the Havant and Portsmouth Deanery Strawberry Tea held on Tuesday 10th July in All Saints Church Hall, Catherington. We were entertained by Handbell Ringers from Catherington and Norma and Dianne had brought MU merchandise - including Christmas cards! Plus there was a large raffle and a quiz on confectionery. It was a very hot day and we were glad to have our cream tea and bowls of fresh strawberries and raspberries and cups of tea inside.